This is one of the charts I used in the book to help the reader gain familiarity with trilobites. It is based on a figure in Euan Clarkson's textbook on invertebrate paleontology. The Paleozoic era comprised six major time periods spanning from 542 to 251 million years ago, as indicated by the numbers along the bottom of this chart. The blue lines show when and how long each major trilobite group lived. Representative drawings of selected group members are only roughly scaled to size, with smaller species greatly expanded so they are visible on the chart. The range lines of each family group of trilobites are clustered according to the order to which they belong, with the right margin of the chart showing the names of the nine orders of the trilobites and the order Nektaspida. The rocks of Black Cat Mountain were deposited in the lower Devonian, almost 418 million years ago, represented by the vertical line passing through the middle of the chart. The blue trilobite range lines crossed by this line indicate which groups of trilobites should be found at Black Cat Mountain. Those present in the collections include the Scutelluina, Odontopleuroidea, Lichoidea, Phacopina and Proetoidea. Missing groups at Black Cat Mountain include the Cheirurina, Calymenina and Harpina, but they have been found elsewhere in the world from rocks equivalent in age to Black Cat Mountain. The remaining twenty groups were extinct by the end of the Silurian. A key to the trilobite range chart is given below. 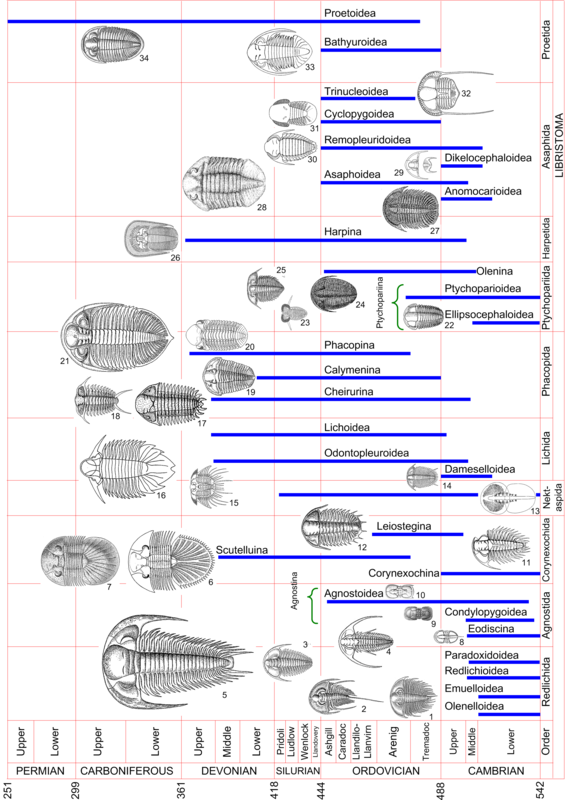 This table lists the names of the trilobite examples, using the numeric labels next to each drawing shown in the chart. Formal scientific names are in italics, together with approximate historical range for each example. Drawings of the trilobites came from the 1959 Treatise, except Naraoia, which I borrowed from Zhang, Shu, and Erwin, 2007, who presented convincing evidence that the Nektaspida were not trilobites. The relationship of trilobites to other animals is illustrated in an excellent poster developed by Neal Olander. To view his poster click on this link: Tree of Life. 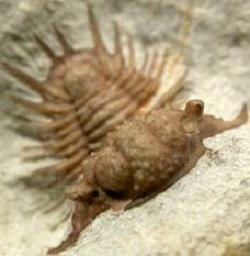 You will find the trilobites between the arachnids and the crustaceans. This Tree of Life indicates the appearance of each principal animal group in the appropriate geologic time period, together with representative photographs. These helpful graphic features are seldom indicated in cladistic diagrams of animal relationships. This 2 MB file can be downloaded to your computer for closer viewing.